Tutorial Moving Data to Samsung Galaxy S8/S8+ - Have you buy this phone? This tutorial guide you to move or transfer data from your previous device to new Galaxy S8/S8+. Bixby features makes your S8 helpful that assisting in completing tasks, telling you what you’re looking at, learning your routine and remembering what you need to do. S8 plus power full with Octa-core (2.35GHz Quad + 1.9GHz Quad), 64 bit, 10nm processor, 4Giga RAM, 64 GB internal memory, 5G Evolution, 5 Level Seurity, Android 7.0 and more features. Lest move to Samsung Galaxy S8/S8+, with very high security level. There's iris scanning for airtight security, face recognition for unlocking your phone right away, and defense-grade security that stands guard around the clock. 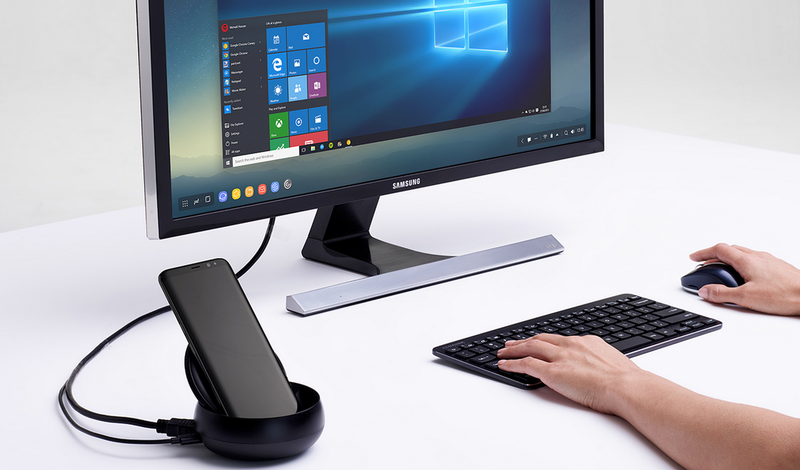 You can transfer contacts, images, and other data from a previous device to Galaxy S8/S8+ via Smart Switch (wirelessly or using a USB connector) or Samsung Cloud. Samsung takes copyright seriously. Only transfer content that you own or have the right to transfer. Galaxy S8 User Manual to transfer data between mobile devices via Smart Switch. You can launch Galaxy S8 Smart Switch by tapping Apps → Settings → Cloud and accounts → Smart Switch. If you do not have the app, download Smart Switch from Galaxy Apps or Play Store. 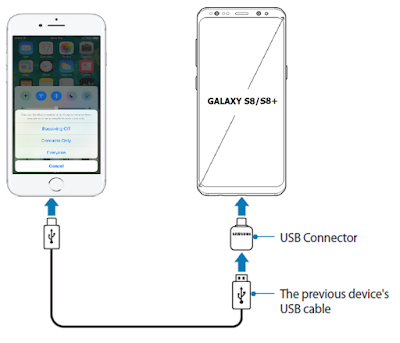 You can connect your previous device to your device with the USB connector and a USB cable to easily and quickly transfer data. Plug the USB connector into the multipurpose jack of your device. Connect your Galaxy S8 or S8+ and the previous device using the previous device’s USB Data cable. When the app selection pop-up window appears, tap Smart Switch → RECEIVE. On the previous device, tap ALLOW. 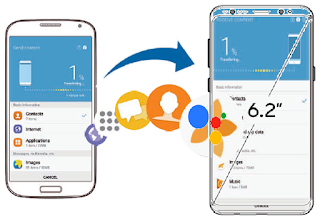 Your device will recognise the previous device and a list of data you can transfer will appear. Do not disconnect the USB cable or USB connector from the device when you are transferring files. Transferring data increases the battery power consumption of your device. Ensure that your device is sufficiently charged before transferring data. If the battery power is low, data transfer may be interrupted. Samsung Galaxy S8 guide to transfer data from your previous device to your device wirelessly via Wi-Fi Direct. On the previous device, launch Smart Switch. On your device, tap Apps → Settings → Cloud and accounts → Smart Switch. Place the devices near each other. On the previous device, tap WIRELESS → SEND → CONNECT. On your device, tap WIRELESS → RECEIVE and select the previous device type. Follow the on-screen instructions to transfer data from your previous device. Galaxy S8 tutorial transfer data between your device and a computer. You must download the Smart Switch computer version app from www.samsung.com/smartswitch. Back up data from your previous device to a computer and import the data to your Galaxy S8 or S8+. On the computer, visit www.samsung.com/smartswitch to download Smart Switch. If your previous device is not a Samsung device (ex: iPhone 7), back up data to a computer using a program provided by the device’s manufacturer. Then, skip to the fifth step. Connect your previous device to the computer using the USB cable. On the computer, follow the on-screen instructions to back up data from the device. On the computer, follow the on-screen instructions to transfer data to your device. device. You must register and sign in to your Samsung account to use Samsung Cloud. 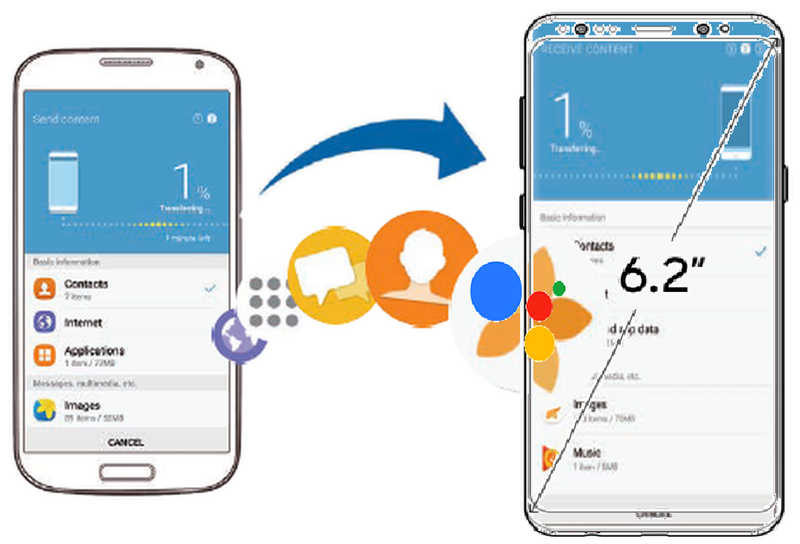 On the previous device, back up the data to your Samsung account. On your Galaxy S8 or S8+, tap Apps → Settings → Cloud and accounts → Samsung Cloud → Restore. Tap and select the previous device from the devices list. Tick the data types you want to restore and tap RESTORE NOW. You can record what you do by capture a screenshot while using the Galaxy S8 and write on, draw on, crop, or share the captured screen. You can capture the current screen and scrollable area. Use the following methods to capture a screenshot on Galaxy S8/S8+. Captured screenshots will be saved in Gallery. Key capture: Press and hold the Home key and the Power key simultaneously. Swipe capture: Swipe your hand to the left or right across the screen. Some times, the Galaxy S8 has a problem not possible to capture a screenshot while using some apps and features. Scroll capture: Capture content that continues across multiple screens, such as a webpage. When you tap Scroll capture, the screen will automatically scroll down and more content will be captured. Draw: Write or draw on the screenshot. Refer to Screen write for more information. Crop: Crop a portion from the screenshot. Only the cropped area will be saved in Gallery. Settings → Advanced features, and then tap the Smart capture switch to activate it.